this small tool enables you to use Function keys within Internet Explorer Mobile (IEM) web sites. Normally, most function keys are catched and used by the OS (GWES) to perfom special actions like menu softkeys, phone call, end phone, volume up, volume down and more. Using a keyboard hook we can catch the function key presses, or better say WM_KEYDOWN and WM_KEYUP messages before the OS can catch them. One challenge was to find the window that processes normal key presses. The keyboard windows messages are not send to the top level window. Using the Remote Spy Tool I found the Window inside Internet Explorer window that finally processes keyboard messages. Now the tool can hook the keyboard, catch F key presses (F1 to F24) and send them directly to the browser window (class name = “Internet Explorer_Server”). The tool simply uses FindWindow and GetWindow to locate the window handle of this window and then does a PostMessage with WM_KEYDOWN and WM_KEYUP directly to the browser window. How can I start an application by just hitting some keys in sequence? The answer: Just use a keyboard hook. Forbiddenkeys is just an addon feature: key codes entered in this list will not be processed any more by your Windows Mobile device. For example, to disable the use of the F3(VK_TTALK) and F4 (VK_TEND) keys you have to enter a binary list of 0x72,0x73,0x00 (the zero is needed to terminate the list). KeySeq list the char sequence you want to use to start an application. For example if this is the string “123”, everytime you enter 123 in sequence within the given time, the application defined will be started. TimeOut is the time in seconds you have to enter the sequence. So do not use a long key sequence as “starteiexplorenow” and a short timeout (except you are a very fast type writer). The timeout is started with the first char matching and ends after the time or when you enter a non-matching char of the sequence. With LEDid you can specify a LED index number. 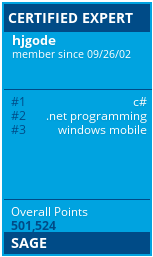 LED’s on Windows Mobile are controlled by an index number, each LED has one or more ID assigned to it. So, with LEDid you can control, which LED will lit, when the matching process is running. 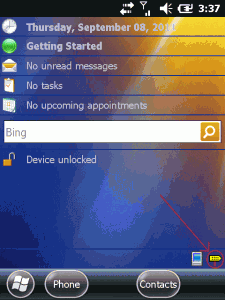 You can even find an ID to control a vibration motor, if your Windows Mobile device is equipped with one. The Exe registry string value is used to specify which application will be started when the key sequence is matched. If the application you want have to be started needs some arguments, you can enter these using the Arg registry value. When you start the KeyToggleStart tool, you will not see any window except for a notification symbol on your Start/Home screen of the device. If you tap this icon (redirection sign) you have the chance to end the hook tool.